4 Blasts In Baghdad Kill Scores Of People : The Two-Way Outdoor markets in two Shiite neighborhoods were struck by blasts on Tuesday. A suicide bomber hit a third neighborhood. Then an SUV exploded in Sadr City, another Shiite region of the capital. 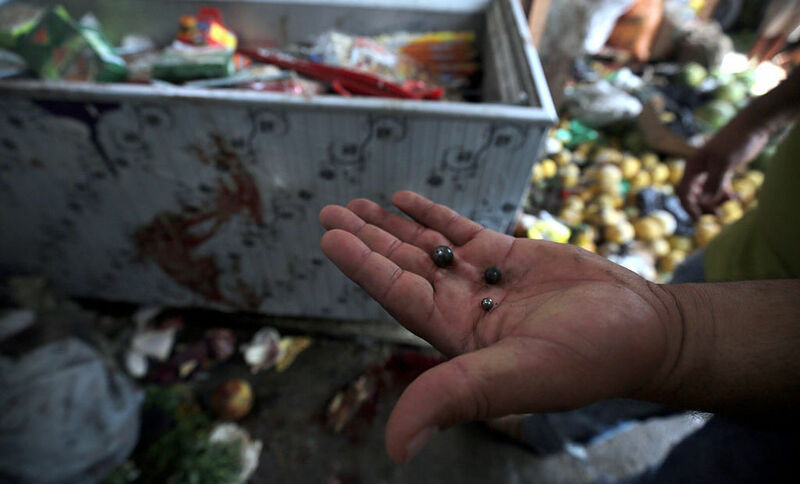 An Iraqi man displays steel pellets at the site of a suicide bombing Tuesday in the Shaab area of Baghdad. More than 68 people have died in Baghdad after four separate bombing attacks on Tuesday, most targeting predominately Shiite neighborhoods. NPR's Alison Meuse reports that an IED detonated and a female suicide bomber blew herself up in a crowded market in the eastern neighborhood of Al-Shaab. More than two dozen people died in that attack, according to The Associated Press. A male suicide bomber struck another neighborhood near Al-Shaab, Alison reports. A car wired with explosives was set off in a fruit and vegetable market in Dora, in the southern part of the capital. There were multiple fatalities and more than a dozen injuries, the AP reports. Then an SUV blew up in the Sadr City district, killing at least 22 and wounding 36, Alison reports. Al-Shaab, Dora and Sadr City are all are predominantly Shiite Muslim. One of the attacks has been claimed by the Islamic State, Alison says. No organization so far has publicly claimed responsibility for others, but the AP writes that they too "bore the hallmarks" of the Islamic State. The militant group is Sunni and regularly targets Shiite communities in terrorist strikes. Last Wednesday, a string of ISIS-claimed attacks in Baghdad killed more than 85 people in what Alison says was Baghdad's bloodiest day of 2016. Those suicide bombings hit Sadr City and two checkpoints in Baghdad. "Members of Baghdad's provincial council say ISIS is switching tactics as it loses ground, taking advantage of stretched security forces in the city," Alison reports. "The council is calling for mainly Shiite government paramilitaries to take charge of Baghdad's security."